How far along: 31 Weeks-Down to the single digit countdown! 9 more weeks!!! 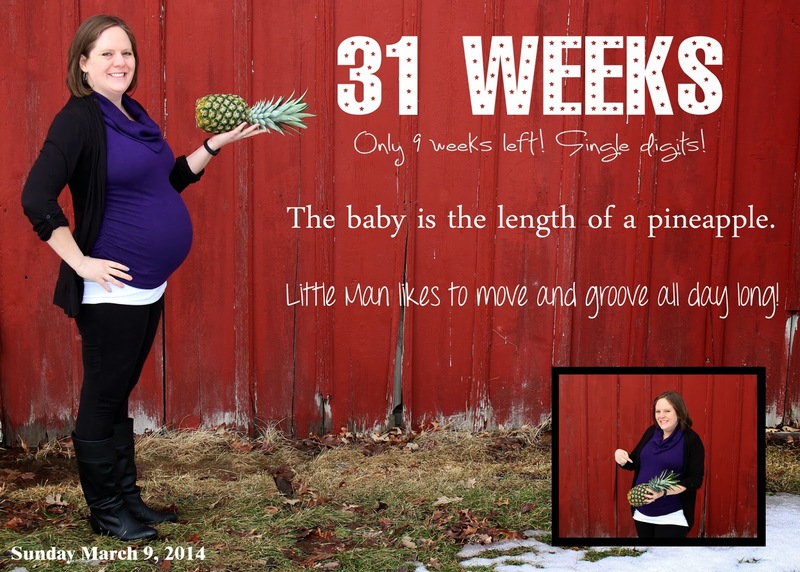 How big is the baby: Baby boy is the length of a pineapple! 16.2 inches! Weight gain: Stayed the same as last week-29 pounds. Phew! Rings: Still fit! No problem! Belly Button: Still an innie! But a shallow one! Doctor/Medical/Body Stuff: I definitely feel tightening once in a while. Nothing regular or painful. Just super uncomfortable! Sleep: I've been waking up more frequently with leg cramps in my calf. It is awful for me. And Adam because he gets woken up by me yelling for help to rub it out. He's such a trooper. But I feel bad giving him these middle of the night heart attacks. It usually happens an hour or 2 before it is time to wake up. I hate it! I couldn't possibly drink more water than I do, so I am going to try the potassium thing and eat more bananas. Movement: I sometimes feel like he is playing a drum set in there. What I miss: Being able to bend over and tie my shoes. I was at Hobby Lobby on Saturday and my shoe was untied. There was no way I could bend over and tie it. So I had to just ignore it. I managed to tie it in the car. Then I went to Target and the other shoe came untied! This is why I have been wearing my boots most of the winter! I'm lucky my feet haven't swollen at all. Otherwise I don't even know WHAT I would have worn on my feet this whole long nasty winter. What I am looking forward to: Making curtains! I bought blackout liner and my mom ordered fabric for me for the curtains (it had to be ordered since they don't have enough in the store). It should come in this week. Then I can get started making the curtains! It will really pull the room together! Baby Projects: I got a TON of stuff put away in the baby's room this week. The closet looks almost full with so many of the hand-me-down clothes we received from friends! I designed some sayings for the walls this weekend and also got in the mail some prints of John Deere tractors I ordered from Etsy! Those aren't actually hanging yet. I love to just walk in the room to look at what is done so far! "Can we talk about your baby?" "Is it disgusting that he eats your blood?" Oh! And This: We were supposed to have a car seat safety class and hospital tour on Thursday. Except I totally forgot about it and was working late at school. I was out of my classroom in the copy room and talking to someone and my phone was almost dead so I didn't have it with me. Then Adam pulled up at 5:55 wondering where the heck I was and said, "I guess we aren't going to our 6:00 class?!?" DOH! The grey chevron changing pad cover came in! Sunday Adam and I worked on making a hanging drum lampshade!